The power of Facebook ads is found within the targeting. Success and failure will be determined by how well you are able to zero in on the audience that will respond to your messaging. It’s why I say that Facebook ads don’t fail, but advertisers do. The tools are available for you to do some amazing things when utilized properly. 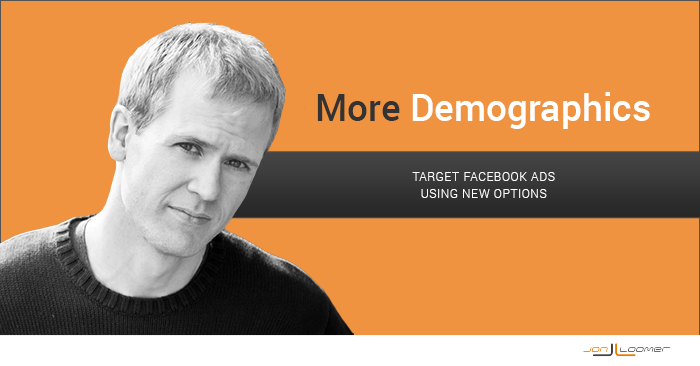 Today I am going to focus on the demographics enhancement that allows advertisers to target Facebook users in new and powerful ways. These statuses are all pulled from Facebook user profiles. 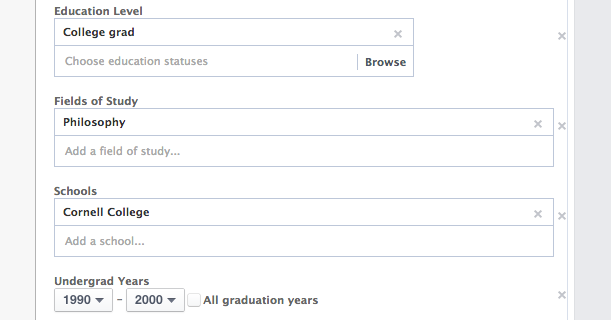 Facebook allows advertisers to target users based on the type of degree, field of study, school and year of graduation. All of this information is pulled from Facebook user profiles. Targeting based on career just got a whole lot more powerful. You can manually target Employer and Job Title. 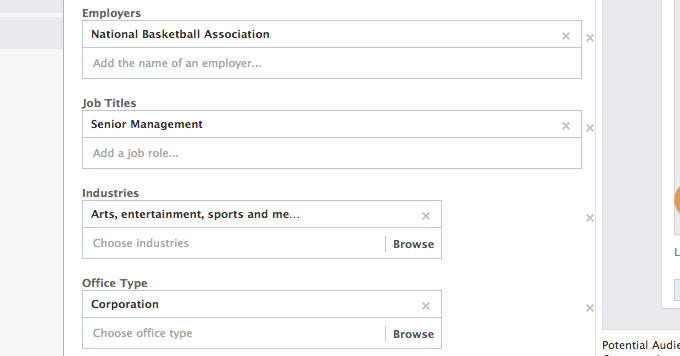 But you can also use Facebook Categories to target users based on the industries they work in. This is one of the Partner Categories from Epsilon. Some of this data was moved from Partner Categories and into More Demographics. Income is either consumer self-reported through a survey or estimated based on a variety of demographic data such as age, occupation, home ownership, and median income for the local area. Modeled based on age, income, presence of children, occupation, property data, vehicle data, investment interest and census median data. When you visualize your ideal customer, where do they live? Do they own or rent a home? How much is that home worth? And who lives in it? You bet, you can target based on this demographic data. All of this data comes from Axciom. You can also target based on household composition. This data is sourced by data mining partner Epsilon. 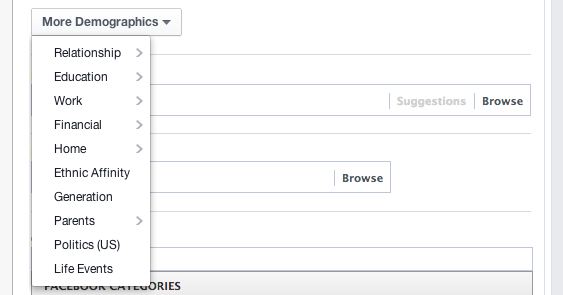 There isn’t much available here now, but Facebook allows you to target users who define themselves as Hispanic. We can assume this will be expanded in the future. 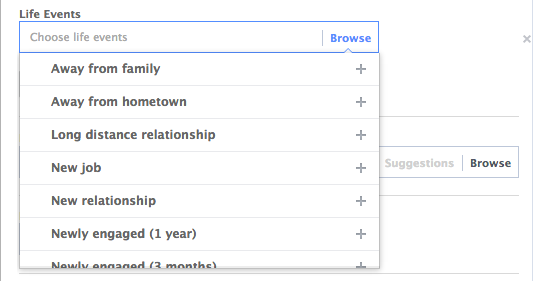 Right now, you can only target based on the Facebook Category of “Baby Boomers.” These options will undoubtedly grow, though I question the value since you can otherwise target based on age. If your product or service focuses on children or their parents, this could be an incredibly valuable option for you. 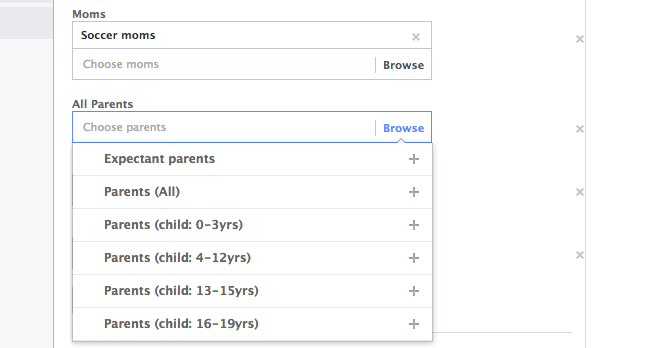 Facebook asks users to share names and ages of their family members, regardless of whether they are on Facebook. Advertisers can then target ads based on this information. 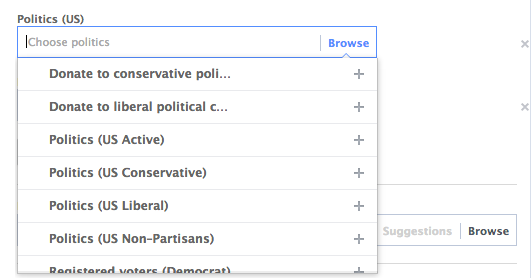 Data partner Epsilon allows Facebook advertisers to target users based on political affiliation thanks to completed surveys and records of donations made. Finally, advertisers can target users based on recent changes they’ve made to their profiles. Where Does Facebook Get This Data? It will undoubtedly sound creepy to some that you can target based on some of this information. But if you get past the creepiness, this data can be used to generate incredibly relevant — and useful — advertising. The first is easy to explain. If you’ve recently moved, changed jobs or got engaged, advertisers can target you based on this information. The second has actually been around for more than a year in the US via Partner Categories, but some of this targeting has been moved to the More Demograhpics area. Facebook partnered with data mining companies to collect additional information on users for targeting purposes. Whenever you fill out an application or survey or make a large purchase, data mining companies often get access to this information. As always, advertisers have no access to the names associated with this data. For more on how this data is used, make sure you read this message from Facebook. How Can Advertisers Use This Data? If you’re seeking to reach newly engaged couples, you can select ‘Newly Engaged’ as a target audience and overlay a timeframe of 3 months, 6 months, or 1 year+. If you represent a school, you can select an audience with ‘Some College’ to promote returning to college to finish a degree. If you’re a recruiter, you can find people with specific job titles based on the role they’re seeking to fill. If you’re a B2B Technology or Telecom advertiser, you can find the right job title, even at the right companies, to connect directly with decision makers for IT purchases. Note that Core Audiences also allow advertisers to target using “and” statements rather than “or” statements. different targeting types are now connected via an ‘and’ statement. Note that as powerful as this is, I recommend that you start first with users most closely connected to you. You can certainly have success with this demographic targeting, but if you have a strong customer list you should have the most success first with those who already know who you are. Depending on budget and the sizes of your audiences (Fans, Subscribers, Website Visitors), you may or may not need to move beyond these groups. Have you experimented with Core Audiences and the More Demographics targeting? What results are you seeing? 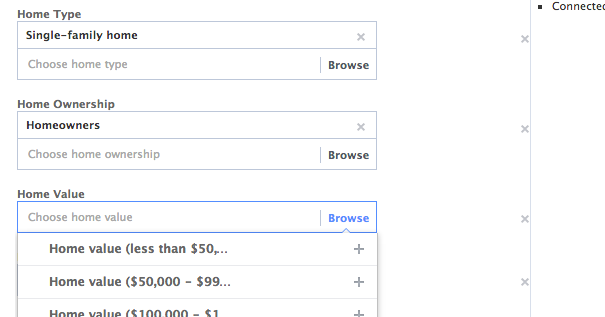 How much do you know about Facebook Ads? Schedule one-on-one time with one of our marketing experts Jon, Andrew or JR. The PHC provides members with access to hundreds of advertisers who have done what you’re trying to do, have worked in your industry and who can pull from valuable experience. Join more than 100,000 marketers and subscribe to my mailing list to keep pace in the world of Facebook advertising! Feel like you're always one step behind? Jon will keep you updated on everything you need to know about the latest updates related to Facebook advertising.